¡Hola amigos! Happy belated Easter! Though I may have been slightly jealous when the rest of you were on Spring Break a month ago, this past week definitely made all of the waiting worthwhile. In Spain, and most of the rest of Europe, they don’t really have a “Spring Break” like we do in the U.S. Instead, they have Easter Break, which falls, you guessed it, around Easter time. As I mentioned in my last post, I got a week off from class for our break, and Rowan and I decided to spend it together in Italy! We went to Venice for 4 days, and Florence for 4 days. Venice was really cool and unlike any other city I’ve been to before. The city is on a group of islands, separated by canals and linked by a bunch of bridges. The streets are all really narrow because there are no cars on the island, and all of the streets kind of look the same (narrow, going along a canal with a bridge) so navigating around the city proved to be a difficult task. For example, it took us an extremely long time to get to our hostel because the map we had was tiny and the street we were supposed to turn on looked more like a sketchy alleyway to us (we actually called it “The Sketchy Alleyway” for the rest of our time there). We decided to explore on our own for a while on Sunday, before we went on a walking tour. 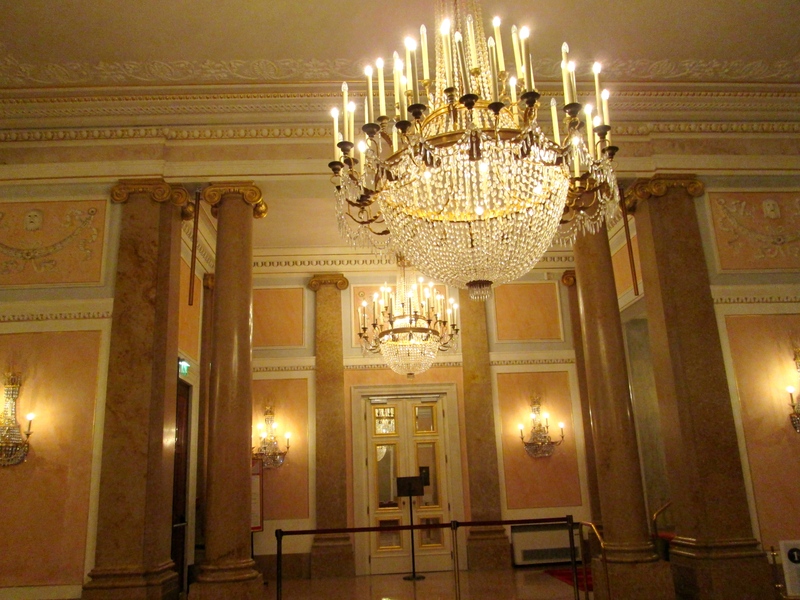 We stumbled across Teatro La Fenice, one of the most famous opera houses in Italy and all of Europe. We got to walk through the theatre and see all of the different rooms, and got free audio guides to hear about all of the history behind each room. We also got lucky enough to watch a few minutes of a rehearsal that was going on onstage. We think it was La Boheme. I wish I could have taken pictures or videos of the rehearsal, but that wasn’t allowed. But it was really cool to watch since I have never been to the opera before. Later we went on our walking tour of the city, which was really nice because we got to hear a lot of things about the history of the city, including facts about how it is slowly sinking. The second part of our tour was on a boat, which was really fun, but apparently did not satisfy our urge to ride boats. We were really determined to go on a gondola ride down the canal, but when we asked for the price it was 80 euros per ride, which seemed way too expensive for just one ride. So we decided to try to get a group of people to go with us so we could all split the amount and it would be cheaper. This didn’t end up working out unfortunately, but we watched a lot of gondola rides and even got our picture taken by a random man who was going by on the boat, so I think we basically got the full experience. We spent our second full day there exploring some of the nearby islands. 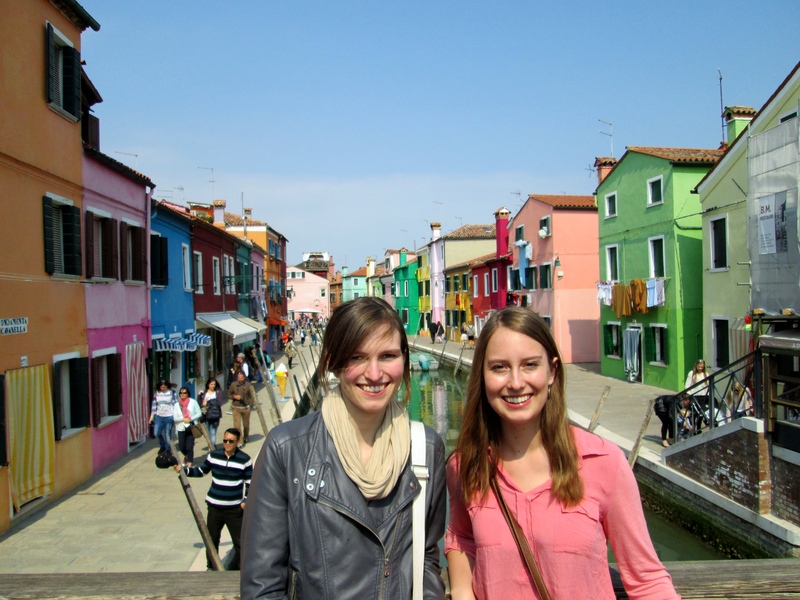 The first is called Burano, and is a really cute little town with canals like Venice. What makes it special is that all of the houses and buildings are painted really colorfully. It has become a bit touristy, and I couldn’t help wondering what the locals think of all of these people walking by and taking pictures of their brightly painted houses, which to them must just seem normal. Next we went to Torcello, which was even tinier, and only really had one church that we went inside, and a few cafes. We stopped at one cafe to have crepes, which were delicious. 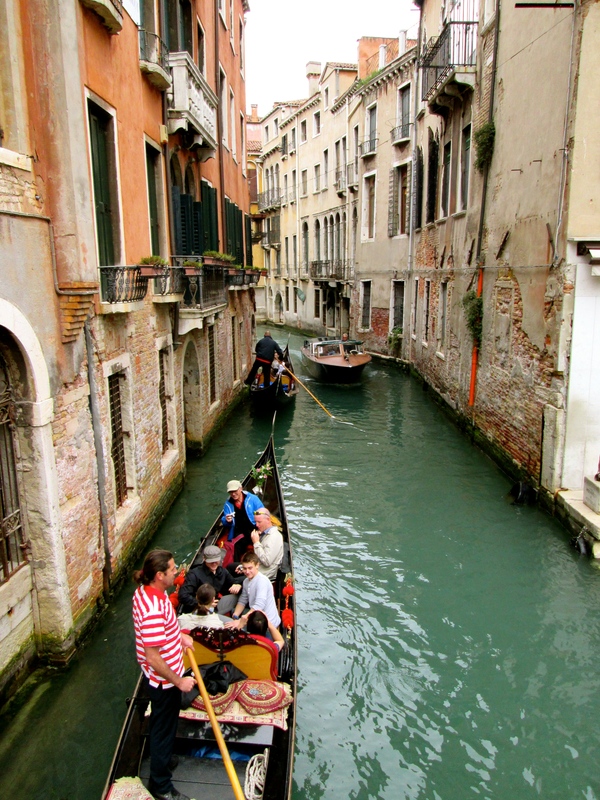 We then made our way back to Venice, which proved to be more difficult than it should have been because we got on the wrong water bus and had to get off and wait for the right one to take us back. Venice was a lot of fun, and when it was time to leave on Tuesday we definitely felt that we could have stayed and seen more even though the city is fairly small. One of the highlights was definitely our hostel owner, Amran, who shared a bunch of funny stories with us about Venice and people who have stayed in the hostel, and let us sit and talk to him for hours! When two guys from New York started giving us a hard time and making fun of Texas, Amran agreed that he would rather visit Texas than New York, which kind of made our night. We were obviously not alone in our appreciation for Amran, because behind his desk the entire wall was filled with thank you notes written by people who had stayed in the hostel. 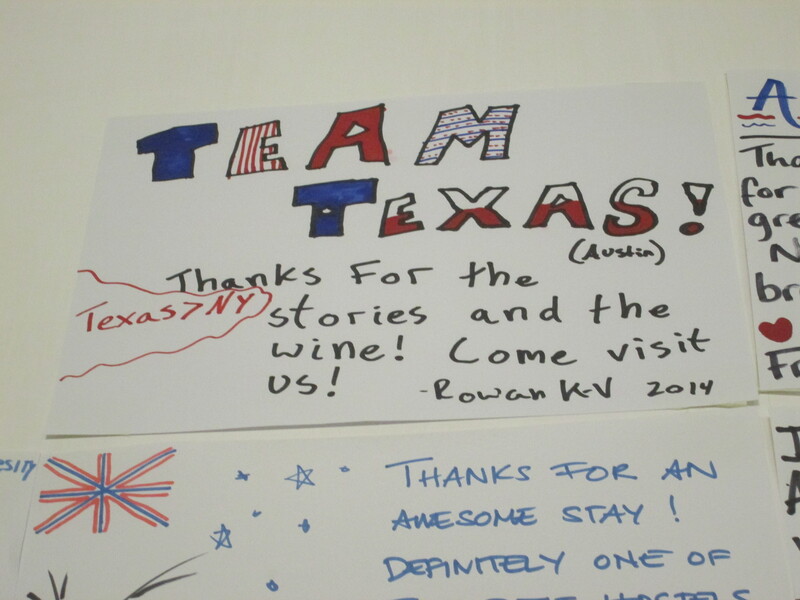 We decided to make ours have a Texas theme, and poke a little fun at the New York boys. Tuesday afternoon we got on a train and headed to Florence, where we would stay until Friday night. The couple sitting next to us on the train were pretty friendly, and Rowan and I both agreed the husband was definitely not quite ready to leave behind his youth. He talked about his trip to Amsterdam with a bit too much enthusiasm, right before showing us pictures of his two young children. 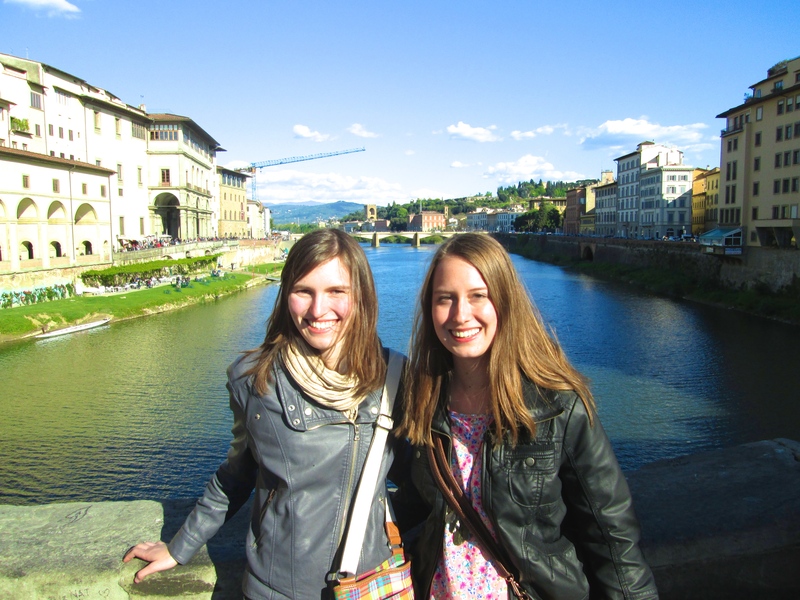 Florence was definitely an easier city to navigate in comparison to Venice. There are a couple of big landmarks that, if you can find them, you can pretty much find anything. The first night we just wandered a bit and ended up stumbling upon a lot of the famous sights including the Duomo, Ponte Vecchio, Santa Maria Novella and Santa Crocce. But we waited until the next day to explore them more. 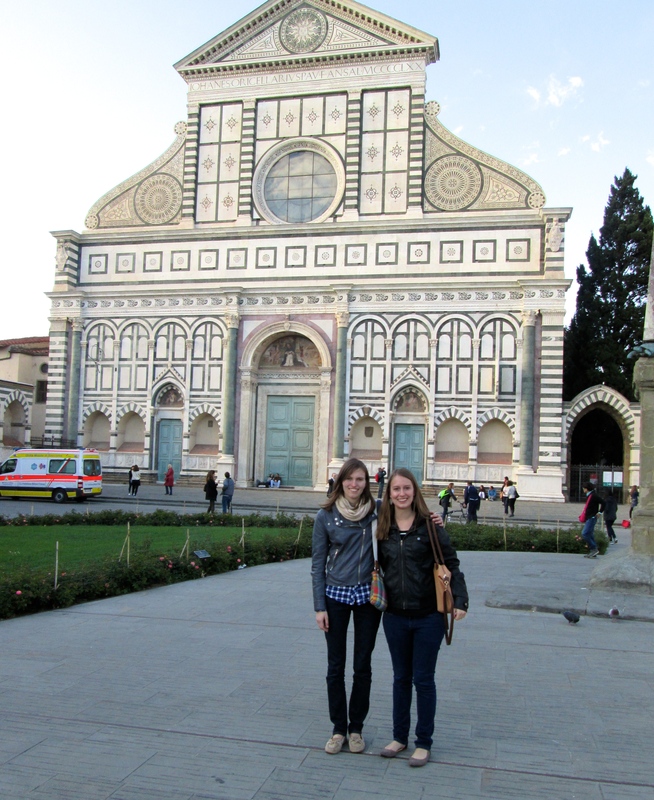 We had a list of things we wanted to do and see in Florence, and I think we did a pretty good job accomplishing all of them. We woke up bright and early Wednesday morning to go to the Uffizi Gallery, which is one of the oldest and most famous art museums in the world, and one of the top tourist attractions in the city. It took us hours to go through the whole thing, and it was definitely worth it. 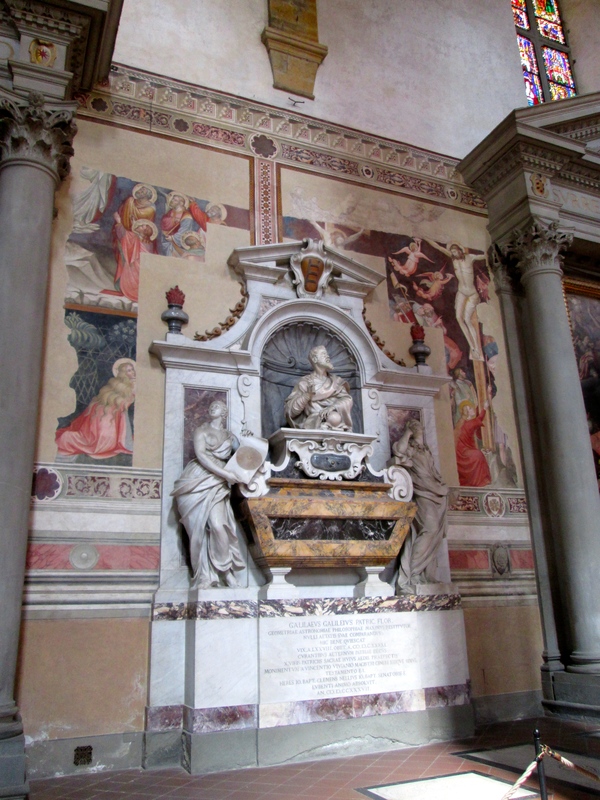 It has a huge collection of Renaissance art, including a lot of sculptures. Me and Rowan’s favorite part was laughing at all of the bizarre faces of the babies in paintings. Next time you go to a museum, pay special attention to the fact that all babies during the Renaissance period have the faces of adults. They don’t look like baby faces at all. It’s quite strange. After the gallery we met up with our designated tour guide, Nathan, who I met in Barcelona and basically forced into being our tour guide for the week. He was nice enough to show us around and put up with listening to our incessant gossiping about people and places he didn’t know. 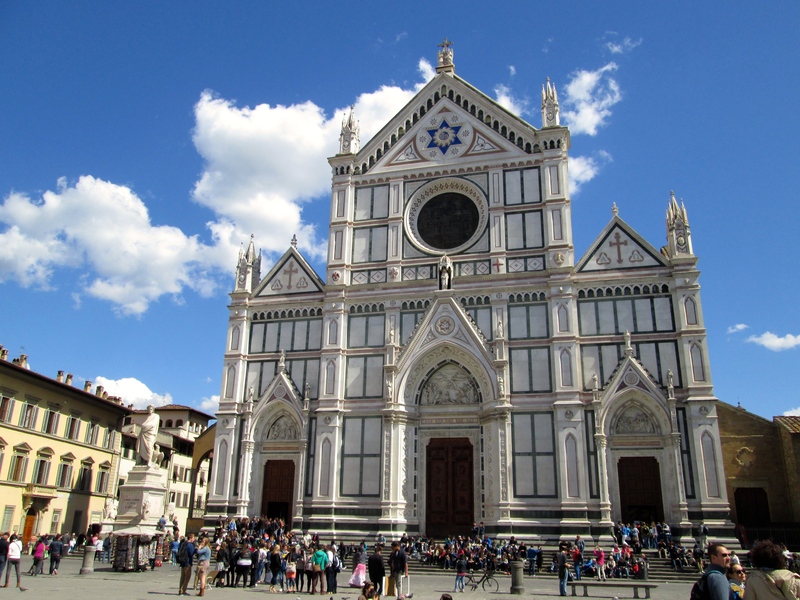 First he took us to go inside the Basilica of Santa Crocce, the main church and another big tourist attraction in the city. 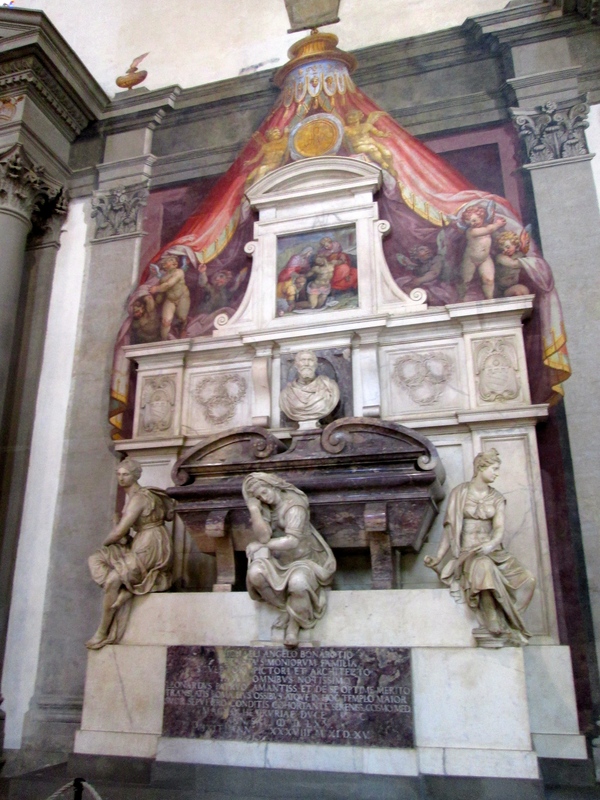 The church happens to be the burial place of many well-known Italians, including Michelangelo, Galileo and Dante. It was really beautiful inside, with a lot of stained glass windows and really detailed wall paintings. We went back inside Thursday night, because all of the churches were free at night as part of Semana Santa (Holy Week) before Easter. We also visited the Bobili Gardens, a big park with a lot of Roman sculptures, and Ponte Vecchio, a bridge over the Arno River, which was built back in Roman times. It is the oldest bridge in Florence, and one of the top tourist attractions. In Medieval times, Ponte Vecchio was a top place for jewelry shopping, and today the bridge is still lined with shops selling gold and jewelry as well as tourist souvenirs. We also went to Piazza Michelangelo which is on top of a hill and has an amazing view of the entire city, as well as a very pretty rose garden. And of course I have to mention the food we ate, since this was a week in Italy and all. Rowan and I stumbled upon a couple of little cafes, one with really good pasta, and the other with salads. We were both really craving a salad, which I know sounds stupid since we were in the land of pasta, pizza, gelato, and other carb-stuffed things. But the salads we had were amazing! Nathan also took us to two different sandwich shops, which were both delicious, as well as a gelato place that serves organic flavors such as kiwi, pistachio, cinnamon and even a wine flavor. We also went to Secret Bakery, a bakery that really is secret unless you know where to find it. It is in a random alleyway, in a tiny room that I definitely would never have noticed on my own. They bake the pastries fresh, and they were delicious! Overall my Spring Break was a week I will never forget. Italy was such a fun country to visit, and I feel like I actually learned a lot about the history from the tour in Venice (be proud mom and dad!) From the food, to the art, to the beautiful landmarks, I would definitely recommend both Venice and Florence. I hope I can go back someday and maybe explore Rome and other parts of Italy as well! Welcome to my blog! My name is Shelly, and I am a 20-something living in Austin, TX. I originally started this blog in 2014 during my semester abroad in Spain, and though I still enjoy writing about my travels, I mostly focus on lifestyle and wellness content. So if you are a 20-something who is looking for a blog you can relate to, this is it! What Does Self-Care Really Mean?